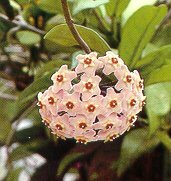 This is the most common type of Hoya (Hoya carnosa) and the one that most people remember seeing at the mothers or grandmothers home. Often climbing all round the wall in the lounge. This is probably one of the hardiest of all the hoyas and can be trained on a wire frame. H.carnosa was named for Thomas Hoym, gardener to the Duke of Northumberland at the end of the 18th century. 'Carnosa' refers to the plants fleshy leaves. 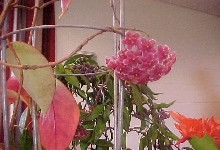 As is typical for members of the milkweed family, the hoya exudes a sticky sap if cut or damaged. I have a variegated form of h.carnosa that has variegated leaves. This plant is a very young one that I have grown from a cutting that I was given at the Hoya and Epiphyllum club in Wellington. But I had a h.carnosa variegated years ago and the flowers were the same as the ordinary h.carnosa. While hoyas do not like to be in direct sunshine they do like a lot of light and often if you have it climbing round the walls it will not get enough light. It is an old wives tale that hoyas must be root-bound. Or in a pot for seven years before they will flower. These plants should be re-potted at least every other year with a fairly coarse potting mix - I usually use an orchid bark for the bottom half of the pot and then fill it up with a good quality potting mix to which 1 teaspoon of garden lime has been added. When the plant is settled in its pot sprinkle some slow release fertilizer on top of the mix. Now that our plants have weathered the Winter months Von Cross writes about the things we should be doing now to prepare our hoyas for the Summer. As soon as hoyas commence making new growth, increased watering and fertilising can begin. Choose a fertiliser low in nitrogen and use it sparingly. Phostrogen, if you prefer liquid feeding, or Osmocote are both well suited to hoyas. Fertilising should have ceased well before the onset of winter to allow new growth to harden. Between about September/October and December is the best time to attend to any plants which need to be potted on. Hoyas generally do not require large containers. Even the most robust vines will perform very well in a 17cm or 20cm pot for years. Smaller growing species may never need a pot larger than 10cm to 12cm. It is often preferable to place the existing container inside a larger one, if the plant becomes top heavy, rather than repot completely. A bark-based potting mix with extra horticultural pumice added gives good results but, so long as they receive water and a little fertiliser from time to time, hoyas appear to be happy in any free draining medium. As an experiment, I have a H.bella which has grown and flowered quite well for several years in a 12cm clay pot filled with nothing other than pumice pebbles. A H.carnosa has perched for four years in a small jam jar containing never more than a couple of centimetres of water, to which a pinch of Phostrogen is occasionally added, and a rock to counterbalance it. No part of its stem is in water - only the tips of its roots. Spring is the best time to make new cuttings. The best material for cuttings is growth matured the previous season. Older wood will root but generally takes longer. Soft new wood will usually rot. Everyone has their own preference for size of cuttings. I find that just one pair of leaves with approximately 2-3cm of stem below (enough to anchor it in the rooting medium) is quite sufficient in most cases. H.linearis is an exception. With this species it is best to have at least to sets of nodes (preferably more) including one set at the base of the cutting. Remove the lower leaves. Reduce by about half each leaf on large leafed species. Rooting medium can be your usual potting mix or, as I prefer, coarse pumice sand. Cuttings usually root within about four weeks as the weather warms up; or even sooner if bottom heat is available. Continue to be alert to the appearance of any "nasties". As well as mealy bugs, other pests which may trouble hoyas are: spider mites, aphids and occasionally scale. Indications that spider mites may be present are dull, lack lustre leaves together with silvery undersides. Very fine webs may be visible. Mites rasp away the green outer layer of the leaves, particularly on the undersides, hence the silvery appearance. To combat a bad infestation. a miticide is usually necessary. Pay particular attention to the underside of all foliage. Regular spraying of plants with plain water will help check mites - they prefer a warm dry home. Species particularly susceptible to mites are H.multiflora, H.schneei. H.bella and H. lanceolata. Yellowing of a few leaves on hoyas may be due to ageing of the leaf, exposure to excessive sunlight or cold. Aphids attack new growth and can be controlled by any preferred insecticide. Where only a few plants are grown, an occasional spray with "Watkins House and Garden Bug Killer" aerosol provides quite good control of all these problems. 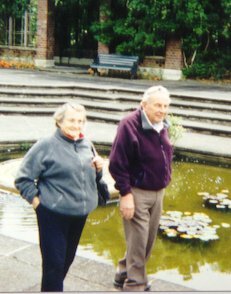 following article are from the journal of the Wellington Hoya and Epiphyllum Club..... the journal is called "Epiflora". I am very grateful for the permission to use photos and articles from this journal. Morris Tarr writes about one of his plants that always arouses a great deal of interest at shows and displays. 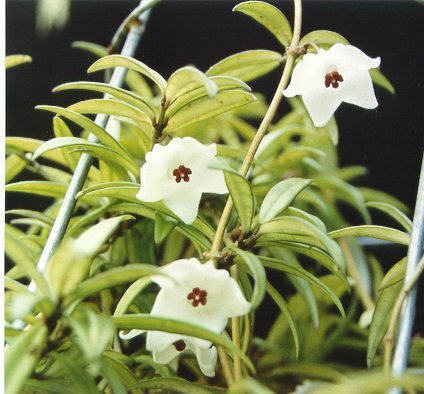 This lovely little plant comes from the warmer regions of Malaysia and Indonesia. It is a plant that is ideally suited to a hanging basket. The leaves are small, deep green and are "lacunose" which means cupped or sunken between the veins, thus giving an uneven appearance to the leaf surface. 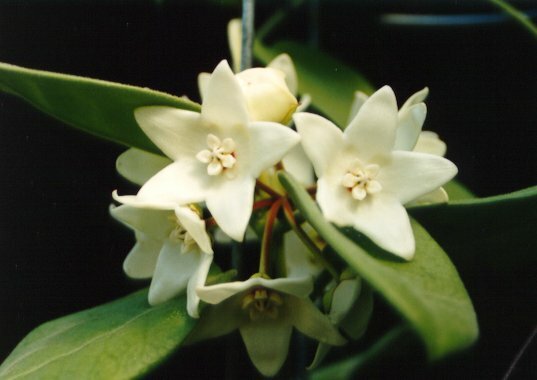 An appealing aspect of this plant is its beautiful soft scent. 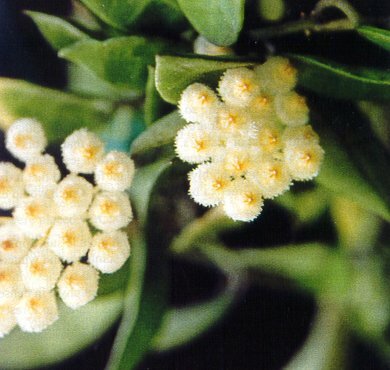 The blooms are a tiny ball of white with a yellow centre, very fuzzy and form in clusters of 15 to 20 flowers. It is a very easy plant to grow and maintain. It is very well suited to indoor conditions - especially a lounge and has quite a long flowering season. Flowering begins in the spring and continues right through to autumn. This is definitely a plant that every Hoya enthusiast should have. 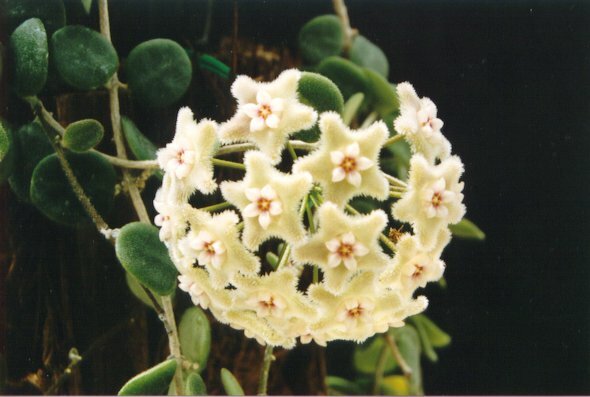 Hoya serpens is a cool growing species from the mountains of Sikkin in the Himalayan region of Western India. The leaves are deep green in colour, round and very small, about the size of a five cent piece (1cm diameter); the growth is ideally suited to a hanging basket. Flowers are pale greenish white and fuzzy with red centres, they are beautifully perfumed and are produced in abundance (at least on my plants). 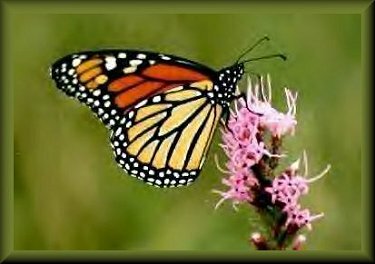 I am aware that some people in different areas - with different climates - have a little trouble getting their plants to flower. In the Wellington region, where I live, they seem to grow and flower in varying conditions. I have a large plant growing in the top, hollowed out part. of a section of Punga fern about 8 inches in diameter and 14 inches tall (these measurements are for our non-metricated friends in America!). 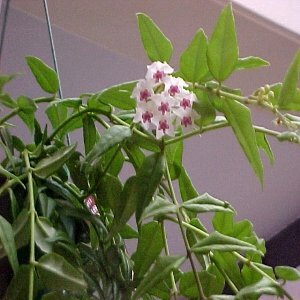 It lives in a heated glasshouse on a shelf about 2 feet from the floor and is a mass of flowers and every year has soon seed pods. I have another plant in a hanging basket in the washhouse area of our house, where it is a lot cooler and slightly draughty, this one also is a mass of flowers. Yet another plant is growing in an unheated glasshouse, also in a Punga ferm pot; this one too is a prolific flowerer and has seed pods. I have grown many from seed and they seem to flower true to form. 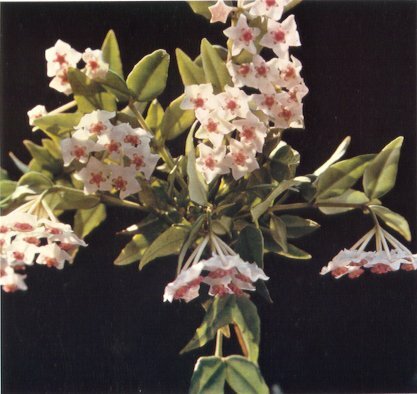 Widely distributed throughout East Indies, found on ridges at heights of 500 - 900 metres. This plant does not grow like a vine or a hanging plant - it has a growth more like a shrub but probably still pays to put a stake in the pot and tie it to it to hold the weight. The flowers are butter yellow which is unusual for a hoya and have recurved petals which makes them look as though they are turned inside out - a little like cyclamen flowers. Like most hoyas the flowers drop a sticky nectar that is sweet to the taste. 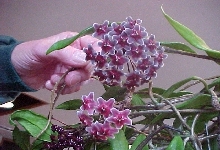 Morris Tarr writes about this delightful hoya. 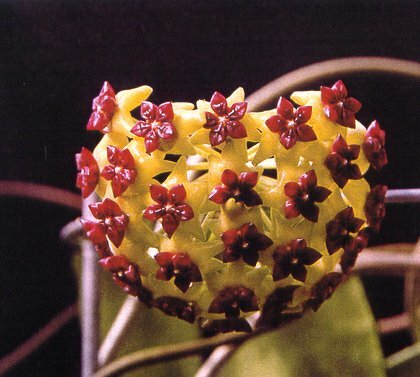 A native of Thailand and the Indo China area, this cool growing plant is commonly known as the "Valentine" or "sweetheart" Hoya. The reason for this is its large, thick heart-shaped leaves which are 2 to 6 inches (5 to 15 cm) long and nearly as wide at the widest point. This plant is an extremely vigorous climber and needs lots of room to grow. It is possibly the most vigorous grower of all the Hoya family. The flowers are in globular clusters of 15 to 25, they are fuzzy and reflexed. The petals are white to pink, and as the flowers age the colour will change to dark pinkish brown due to the straining by the brown honeydew that is secreted from the deep corona, or central crown. These flowers are very consistent and reliable bloomers, they seem to remain in flower for quite a long period. You may have to grow them in a larger than usual pot because of their strong and fibrous root system. I find that if you keep them contained in an upright frame and pruned now and again, that they are easy to maintain and an extremely rewarding plant to have in your collection. Here we have an amazing species from the island of Java. The leaves are olive green, veined in silver and fairly large, 150mm long by 50mm wide. The new growth is a bronze toned colour. The flowers are absolutely sensational consisting of 20 to 30 blooms on each umbel. The petals are waxy lime-green, turning pale yellow as they age, and are set off with a large centre crown, or corona, of purplish red. This plant is very easy to grow. The growth is moderately vigorous. It comes under the intermediate category, which means it requires a little warmth and should not be grown outside in the cold. I grow my own plant in a 150mm (6 inch) square pot, and it grows quite happily contained in a wire frame 6 inches round by 24 inches high. I keep it trimmed so that it does not grow rampant. The plant flowers regularly for me every year, starting in October and continuing on and off right through to March the following year. Each flower umbel remains open for about 10 to 14 days. Oh what joy. My very first flowers on Hoya New Guinea White, and the perfume. I reckon, that if I bottled it in small fancy bottles, I could make a fortune. The umbel is made up of 14 flowers, each one 50mm or 2 inches across, the corolla and corona are pure white with red under the corona. The flowers opened on the 28th April and remained open for about nine days. Leaves are very large grey/green in colour and velvet covered. This particular plant is one of several that I raised from a cutting given to me by one of our members, whose plant had yet to flower for her. I propagated them in September 1992 making this plant about 18 months old. Very self satisfying it is to know, that here in Wellington where it is a lot colder, we can flower some of these more difficult plants equally as well as they can in Auckland. In this article of her series. Von Cross continues her globe trotting and comes a little closer to home - reaching New Guinea, Solomon Islands, Vanuatu, New Caledonia, Fiji, Samoa and Australia. 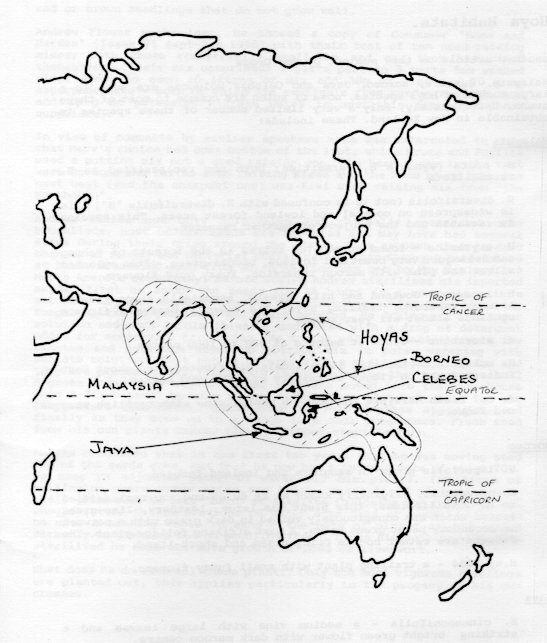 Another large group of hoya species is found in these areas. The Australian species are confined to the eastern coast, from northern New South Wales, Queensland (particularly Cape York Peninsula) and Arnhem Land to the Kimberleys, growing in such diverse conditions as rainforest, dry woodlands, rocky outcrops and sandy coastal areas. H.eitapensis - this species was discovered in north west Papua New Guinea, near Eitape, on trees about twenty metres above sea level. Knowing where hoya species originate from - and the climatic conditions they evolved in certainly helps us to understand the types of conditions we must seek to provide if we are to grow them successfully in New Zealand. In nature it is found matted over boulders in moist forest regions, or scrambling on tree trunks in low, mountainous areas. Pauciflora means "few flowers". They are produced sometimes in pairs, but mainly singly. 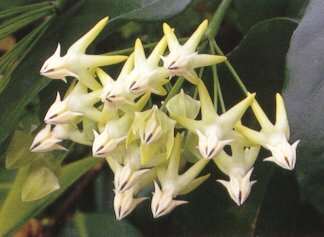 It is reported that plants from Sri Lanka are good bloomers so it would seem that some specimens actually do contradict their name. 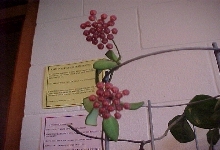 The plant has narrow leaves 0.25" (9mm) wide by about 2.5" (60mm) long. The flowers are pure white, 1.25" (30mm) across with a bright red corona. The perfume is absolutely magnificent. I have found with my plant that once it started flowering (and this was not until the plant was over four years old) that it has never seemed to stop. My plant flowered in May and June, which in NZ is in the middle of winter. It started flowering again in November of the same year and has flowered continuously ever since. There are always two or three flowers out at a time and at one stage there were fifteen. As I write this we are now well into April and there are six flowers open, I can see more tiny buds appearing so when it will stop I have no idea. Each flower remains open for three to four weeks. I grow this plant in a 4" (10cm) square plastic pot; the plant itself is contained in a wire frame 24" (60cm) high. I manufacture these frames myself. The plant is in a small glasshouse which is covered both on the roof and on the side facing the setting sun with 50% shade cloth. It gets very hot in the late afternoon but at night remains quite cool. I feed the plant now and again with Phostrogen liquid fertiliser. Wellington Epiphyllum & Hoya Soc. Hoya macgillivrayi I have a friend in Queensland who grows Orchids and he was telling me that he has H.macgillivrayi in his collection. 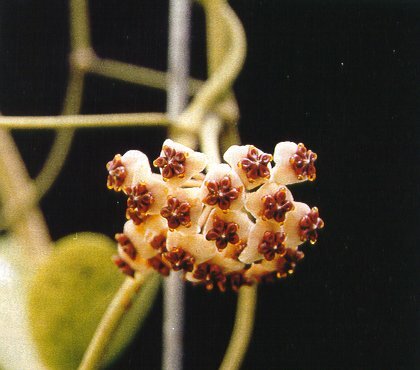 This beautiful plant has some of the largest flowers of any hoya. Each floret, which measures 75mm (3in), is a dark velvety red, with only a suggestion of a lighter coloured "eye". 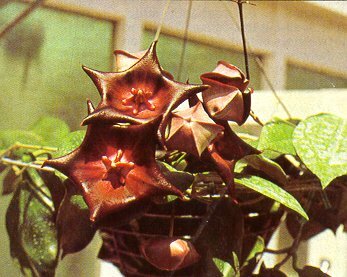 These plants originate from Cape York in Northern Queensland and looking at it one can hardly believe it is actually a Hoya the flower is more like those in the Stapelia family. The benefits of belonging to the society are many; firstly you get to know other people who are interested in the same plants that you are - most grow other plants too. If you live in the lower part of the north island you can attend all or some of the monthly meetings. But even if you live in other parts of the country or overseas there is a wonderful journal "Epiflora" that is published quarterly and is of great value.